Printing Layout: As positioned in photo, Side 1 is the side with the Batavia High School imprint. Side 3 is the side shown with 45th Class Reunion. Side 2 is not shown. Medium Ballpoint: Black, Blue or Red Ink. Fine Ballpoint: Black or Blue Ink. Imprint Area Size: 3" x 7/32" on Barrel. When you want to make the biggest impression possible, you don't just stick your logo one place and hope for the best. If that is what you do and you wonder why it's not working, it's because the more times someone sees your logo, the higher chances you have of them remembering it. The Bic Tri-Stic Pen from PromotionalGiftWholesale.Com is a great promotional pen for expanding your brand! All three sides of these custom pens are available for your logo or company's name to be imprinted on. Not only does it help customers remember your name, but the triangle design makes it easier to write with too. The days of having a personalized pen slip from your fingers or roll off your desk are long gone. Making a positive impression on your customers can sometimes come down to the style of promotional pen you hand out. 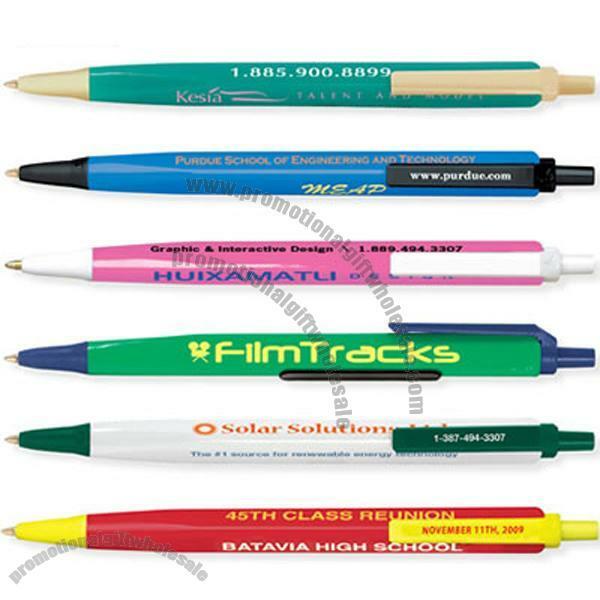 Don't pick the wrong one and lose potential business, pick the Bic Tri-Stic Pen today and watch your brand recognition increase. Call to order them as soon as possible to enjoy free digital or paper proofs! Cute pens with some real personality! I love them! Our logo looks so awesome! I've been handing them out like crazy! I just want to let you know that the pens look very nice, and they definitely got the job done. The search results on your website were very relevant and helpful, and the product details page contained enough information for me to make an informed decision. I will consider www.PromotionalGiftWholesale.Com in the future for my business needs. Thank you for making everything so easy!